It almost feels unfair to put this caveat in front of all casinos on the Game Tech network, but alas, it is essential to give prospective players all salient information before they choose whether to sing up with an online casino, so it is necessary to do so here. 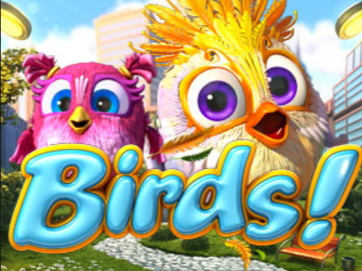 As part of the Game Tech Group, Casino Blu is attached to a questionable history, as Game Tech have been caught (it is necessary to point out that they have been caught in the past, and there is nothing to suggest such things still happen) using unethical practices such as offering bootleg copies of NetEnt slots. It should, in the name of balance, also be added that many players who are currently customers of Game Tech casinos speak very highly of them. It is your choice whether you decide to give the network and its sites the benefit of the doubt. If you choose to consider a Game Tech Group online casino, then there are a lot to choose from, meaning Casino Blu doesn’t only have to fight for recognition against the huge number of online casinos that exist, it also has to fight that same battle on a smaller scale against other sites in its network. 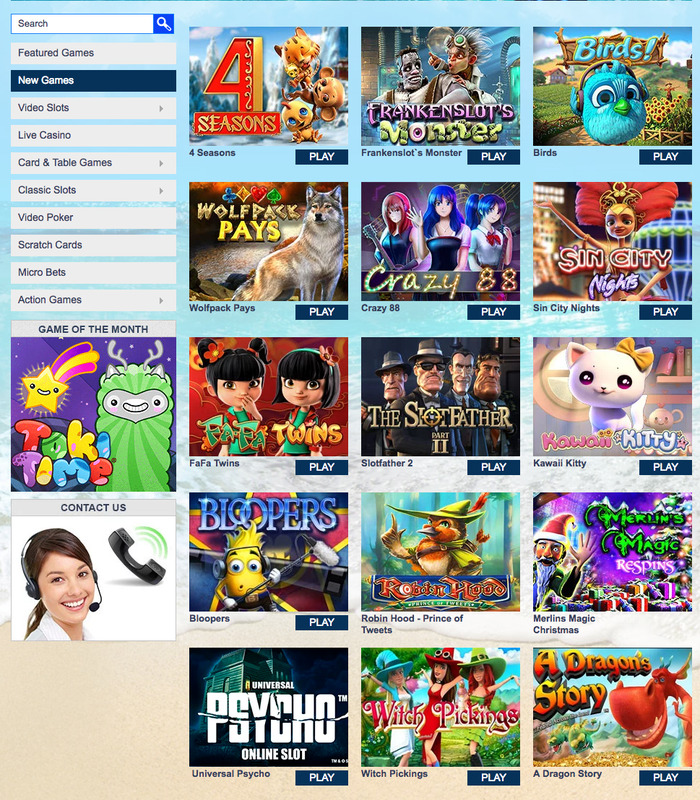 So, does Casino Blu have what it takes to stand out from other Game Tech sites, and other online casinos in general? Casino Blu, or Blu Casino, or Casino Blu Sky (based on the look of the site, the casino itself doesn’t even know!) is a good-looking site. As you would assume from the sites name(s) there’s a lot of blue around here. The background of the site sees you looking out from a tropical beach, with an exotic island in the distance, and a clear, beautiful ocean between the two. You will also find a host of design touches that have been taken from popular games on the site. These games are also accessible, as they are at many other sites, via thumbnails on the homepage which offer one-click access to certain titles. The ease of navigation presented by this, echoes around the rest of the site, with everything you could possible need easy to find. 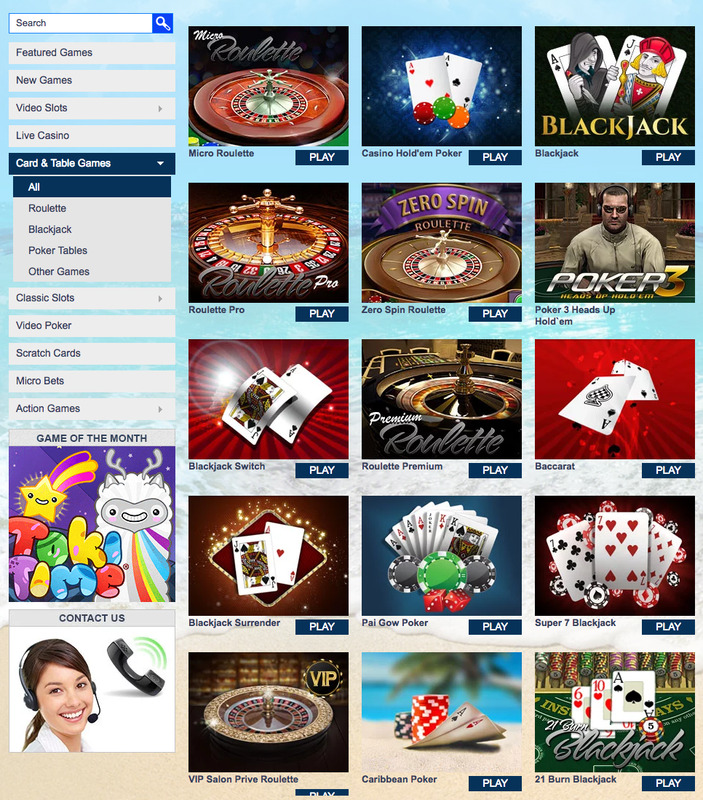 When you combine the attractive concept, excellent execution, and simple navigation of the Casino Blu site, it certainly takes its place as one of the best looking and most accessible Game Tech sites, and puts itself up against the best of them in terms of casino sites in general too! One thing that is known for sure about Game Tech Group, is that all the sites within this network offer an excellent selection of games. However, this is something of a downside again, which is that they all offer pretty much the same excellent selection of games. It’s a real shame that this is true, because it takes a lot of the shine off the choice here when you know that there are numerous other casinos that offer an identical array of games. But, if this is your first Game Tech casino, then it’s still worth giving some credit to how good the variety is here. With titles from the likes of 1X2 Network, Amaya, BetSoft, ELK Studios, Extreme Live Gaming, GameScale, Nektan, NetEnt, NextGen Gaming, NYX Gaming, and Thunderkick providing games from several game types, including video slots, video poker, classic slots, table and card games, scratchcards, action games, a live casino, and more. 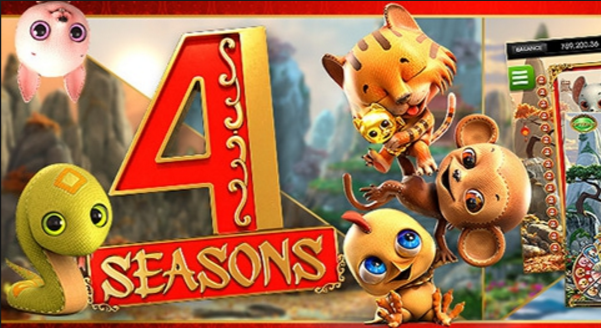 As stated, it is a shame that this is not a unique games list, but that should not take away from the fact that it’s one of the best around, and makes Casino Blu worthy of your consideration.